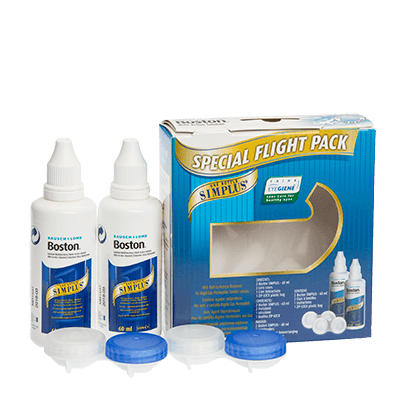 Boston Simplus Flight Pack makes looking after your gas permeable contact lenses easy even when you’re on the go. These 60ml bottles of multi-purpose contact lens solution are conveniently accompanied by a contact lens case. Designed by Bausch & Lomb, the travel pack is specifically designed to meet airport baggage regulations, and provides everything you need to clean, disinfect, rinse and store your contacts whilst on the go. Dirt and protein deposits are removed by the solution, which then adds moisture to your lenses, making them comfortable to wear from the moment you put them in again. Perfect for long-haul travel and hot climates, this solution works to ensure your contact lenses don’t dry out during the day. Never worry about discomfort or lack of clarity whilst travelling with this excellent contact lens solution. If you need a larger supply of solution, why not try the Boston Simplus one month supply?